I had read and enjoyed Peter Mayle’s A Year in Provence. But even the darkest clouds hovering over his English pioneers and their cranky, two-hundred-year-old French farmhouse produce little more than Mistral winds, frozen pipes, and loose roof tiles falling like dandruff. I wanted something darker. 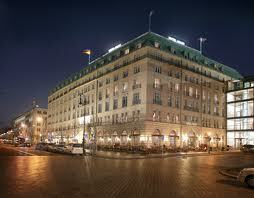 Then one rainy afternoon while sitting in the luxurious lobby of Berlin’s Hotel Adlon sipping tea I saw my man. The smartly dressed self-absorbed young German who would become Klaus Reiner, the villain of The Paris Directive. He was tall, well-built and attractive in that insolent Aryan style. Waiting by the elevators, he was going upstairs to what seemed to be an eagerly anticipated appointment. Something in his expression held me—was it his preoccupied sardonic smile? The curious intensity of his inner gaze? In my novel he would be on his way to suite 501 to meet Emile Pellerin and his partner Hubert Blond, and collect perhaps the biggest jackpot of his life. A product of post-unification Germany, Klaus Reiner is a successful businessman with a warped capitalist dream. If Rupert Murdoch could think of buying Manchester United, why couldn’t Reiner own his own team too? He dreams of one day acquiring Bayern Munchen--the most successful football club in the new Germany. All he needs is enough money. And money is what he earns through his work. Reiner’s metier is murder, his method controlled “accidents” free of all incriminating traces. But in the course of his visit to France, Reiner will discover that the violent way of murder is unexpectedly enjoyable, exciting, even liberating. In Taziac, the businessman-assassin is untethered. Moving beyond his initial target, Reiner will enter a surreal zone without rules, or limits, and become truly scary—even to himself. To Inspector Paul Mazarelle, Reiner’s fate may be tied to his own. Gerald Jay is a nom de plume. He lives in New York City and is at work on a second Mazarelle novel.